Gonna rode out when the east was just starting to settle in the west. He was gonna make the midnight train to Dawn. His trusty steed 'Mitch Pileggi' bore him with the fury of a thousand horses, roughly a thousandth of his size. The dust kicked up as they rode through the streets with Abandon, and his cousin Pete. When they arrived at the station, they were met by the villainous scoundrel (Parenthetical). He stood tall, then curved to one side, guns on his hips. In his mouth was a cigarette, and in that cigarette was another cigarette, just in case. He removed his 500 gallon hat and spoke. "Well, well, well. If it isn't the Well brothers and my old nemesis, Gonna. 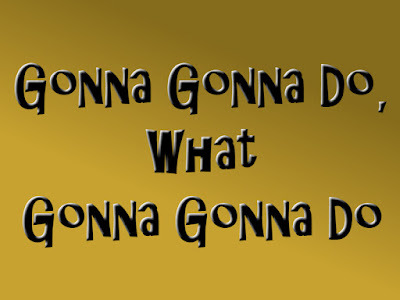 Watcha gonna do, Gonna? I got you surrounded on one side. My guns shoot as straight and true as a metaphor." Gonna removed the tiny party sized cowboy hat from his own head and responded like a man answering another. 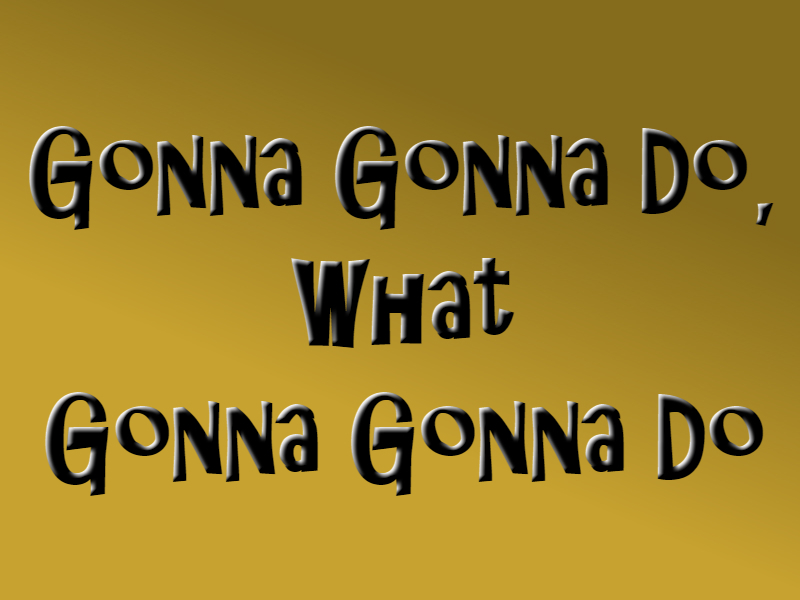 "Gonna gonna do, what Gonna gonna do. And I aims to gonna do something. Namely, ask you to step aside." "And why would I do that?" Parenthetical spat. "Because," said Gonna, eyes narrowing, "I'm gonna be late for my classes if you don't. I'm gonna be teaching Journalistic Writing Technique One-Oh-One this year at the Bedmorforshireside Community College over in Bedmorforshiresideville." "That's...not something I was prepared for. Are there still available spots in that class? Reckon I might could use some good wording. I was gonna enroll last semester, but I got busy killing good people." Gonna put on a monkey mask that gave him an air of mystery. "There's always a hundred reasons not to do something." "Damn, that is true (and slightly mysterious)," Parenthetical responded. "Alright, then, we go together." And so the crew of three, plus one, added to the train, and divided their time by imagining how life was gonna be over the next year. And Gonna had to admit, it was gonna be an adventure.